OK. Well, I sort of just lied. Technically my Birthday is tomorrow. But who’s really going to argue with me about these nitty gritty details? I think as long as we’re within the correct month, it’s close enough. Right? Right! OK. Good. Moving on. 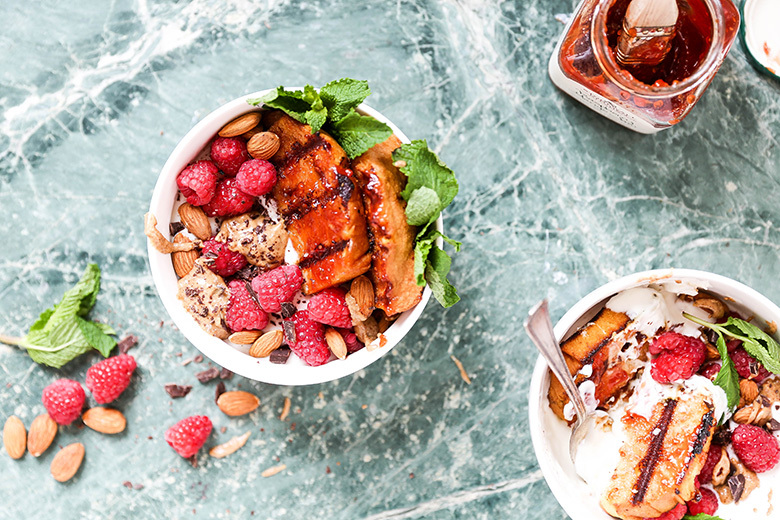 So being that it’s my Birthday and that I’m a sweet tooth kind of gal, I made us something a little indulgent to celebrate the day: Almond Butter and Jam Grilled Pound Cake Bowls. These cake bowls are a rift off one of my childhood favorites: peanut butter and jelly sandwiches. I wrote last month about how peanut butter and jelly sandwiches were one of only two foods that I consistently ate as a kid. And while my palate has expanded considerably since my younger years, I still crave peanut butter and jelly sandwiches on a regular basis. So I decided it would be fitting for my Birthday to pay homage to this tried-and-true food that’s been by my side for 30+ years. But of course, I had to put a bit of a grown-up spin on things. These Almond Butter and Jam Grilled Pound Cake Bowls have all the deliciousness of the peanut butter and jelly sandwiches that I loved as a kid, but with a few twists. First, as you can see from the images, they aren’t really in typical sandwich form. Instead, I deconstructed them and layered all the components into a big bowl. I also swapped out the peanut butter for natural almond butter. And instead of regular white bread, I decided to use pound cake (homemade or store bought – you decide!). The pound cake is sliced thick, slathered with jam on BOTH sides and then grilled until warm and slightly caramelized. The Wonder Bread of my childhood doesn’t hold a candle to this sticky-sweet concoction. 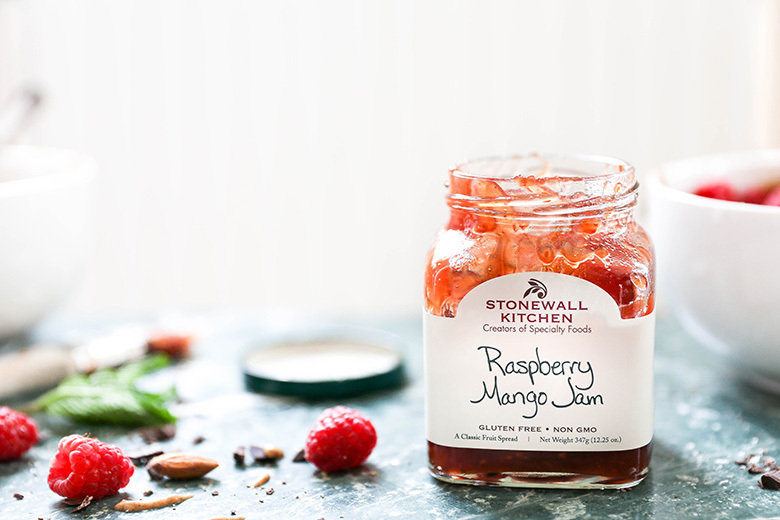 I used Stonewall Kitchen’s Raspberry Mango Jam in this recipe, which is one of their newer products that’s available this season. It’s tangy, tropical notes make it feel more refined than the jams I enjoyed growing up. And while I’m obviously showcasing it here in a sweet recipe, it can easily go savory as well. 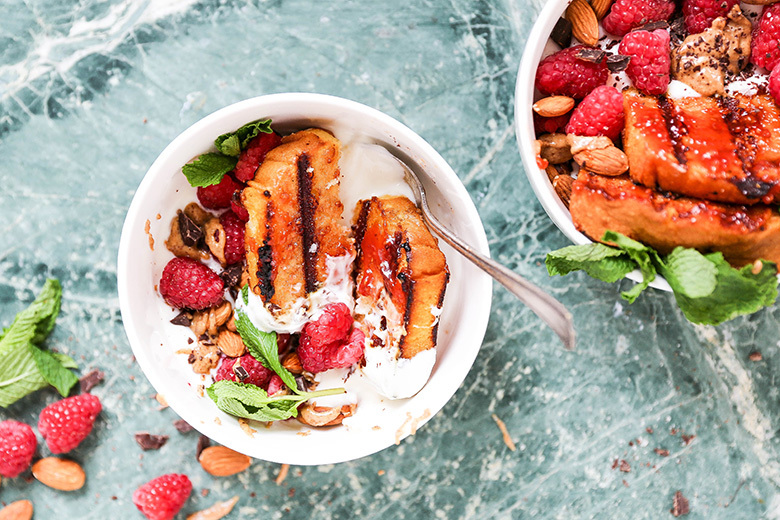 I’m all about this Raspberry Mango Jam on a cheeseboard for Summer entertaining! 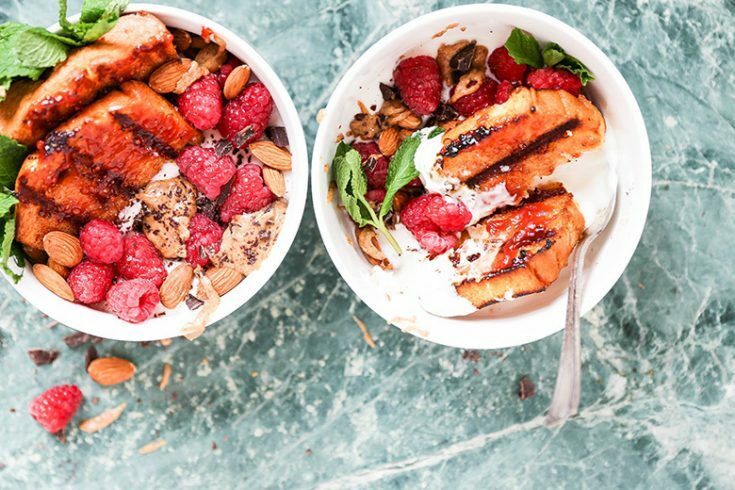 The base for these Almond Butter and Jam Grilled Pound Cake Bowls can be whatever your little heart desires: Greek yogurt (breakfast, anyone? ), whipped cream, ice cream, etc. It’s all good. You do you, honey. Pre-heat your grill to medium-high. Clean and lightly oil the grates. Lay the pound cake slices out in a single layer onto a large baking sheet. 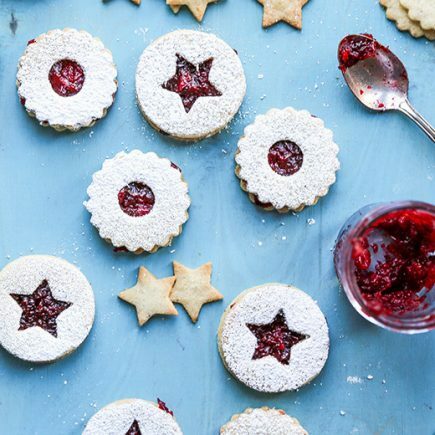 Stir the jam to help loosen it. Then spread a thick layer of the jam onto one side of each of the slices of pound cake. Transfer the slices to your grill, placing them jam-side-down, and grill for approximately 2 minutes. During this time, carefully spread a layer of jam on second side of each slice (the side that is facing up). Then flip the pound cake slices over and grill them on the second side for an additional 2 minutes. Remove the pound cake slices from the grill and transfer them back to their baking sheet, keeping them in a single layer so they don’t stick together. To assemble the cake bowls, add your choice of yogurt, ice cream or whipped cream to serving dishes. 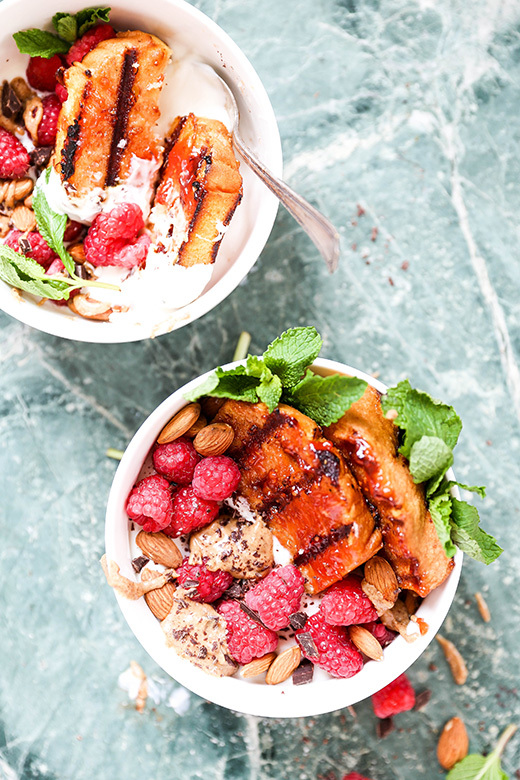 Top with a couple slices of the grilled pound cake, fresh raspberries, almonds, a drizzle of almond butter (you can microwave it to help loosen it), a sprinkle of chopped dark chocolate, a pinch of sea salt and a few fresh mint leaves. Serve immediately. This just might be the worlds best pound cake flavor EVER! love stone wall and the fact you used almond butter and jam. GAH! HAPPY BIRTHDAY!! This looks like one delicious way to celebrate! 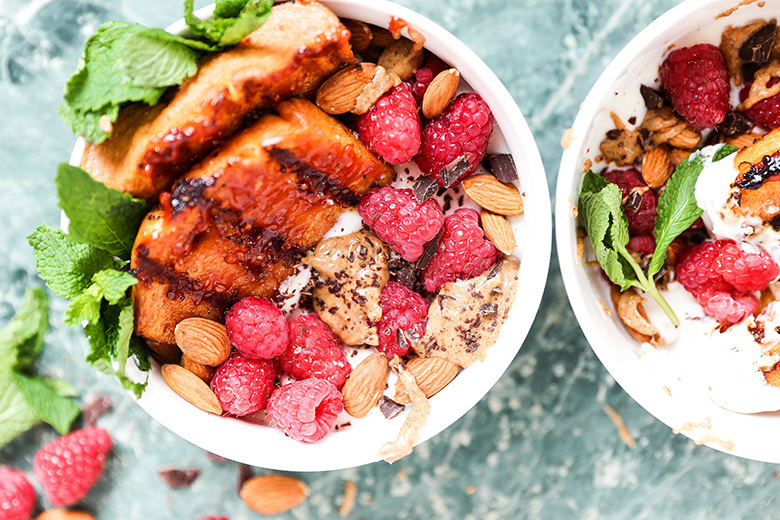 I’m loving all the textures in this bowl and flavors in this bowl, Liz! This jam reminds me of Costa Rica with it’s tropical flavors… you know how I feel about mango 😀 Happy birthdaaaay to you my dear! What a year it’s been for you… but may this next year be your best! Delicious work! Thanks for the birthday love, Traci! It has certainly been a year! Lol! Sweet happy birthday! I agree that cake and jam are…the jam. I think that’s why I love plain cake so much, because toasting thick slices is the best. Yes I agree! Thanks for the birthday well wishes!